Looking after the garden in winter is all about thinking about the future, preparation for the months ahead, planting for the year(s) ahead, and pruning to encourage new growth. Take your notebook for a walk and see if you can make any improvements to the look and flow of your garden. Could you make life easier for yourself next season by grouping plants together? Not only do trees and shrubs dotted around the lawn make grass cutting difficult, but shrubs tend to do much better in groups where they provide shade for one another and offer support when the wind blows. November marks the start of the composting year. A recipe for compost was included in the September issue which can be seen at www.thelocalbuzzmag.com/read-online. If you have space, four pallets make a perfect container. Make a bay by joining three pallets together, secure by either tying or screwing each of the corners together. Start laying your material. 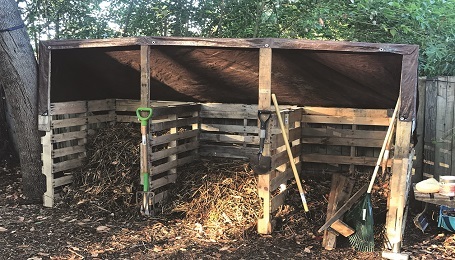 Put the final pallet along the front, secure and leave the material to decompose for six to nine months. I love giving our garden a tropical feel with Banana and Cannas but they do need a warm fleecy wrap and a waterproof coat in winter. This protection can be removed in late April after any risk of frost and they soon start to grow to huge heights, certainly 10 feet tall. I also have lots of Oleanders which give a Mediterranean feel to the garden but, because of the cold and wet, they need to be fleeced too. Last year they emerged looking a bit sad but after a good prune they recovered and flowered as usual. Friends can be invaluable for over-wintering your tender plants, especially if you are away. I am fortunate in having a greenhouse, a cold frame and a frost-free shed which often provides a safe refuge for plants of “absent owners”. If you can’t find a caretaker then fleece is a must. Certain days are perfect for planting your favorite shrubs and roses for next year. The ground should still be warm and hopefully moist, ensuring the roots are well established before the first frosts. You can also move shrubs that have outgrown their spot. We are all tempted to plant shrubs too close together, unaware of just how quickly they reach maximum width in good conditions. Moving alternate shrubs will give them enough room to spread out. 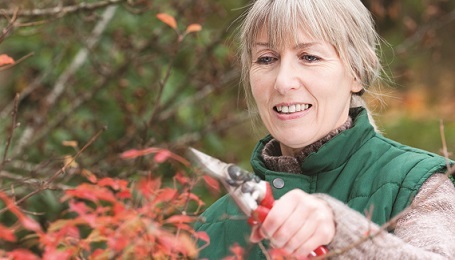 If you are planning a move, give shrubs a trim at the same time, taking out any stems that have died back or which are crossing over and rubbing others. Aim for a balanced shape with an open centre to let in lots of light. Water in well after planting and give a good covering of mulch. 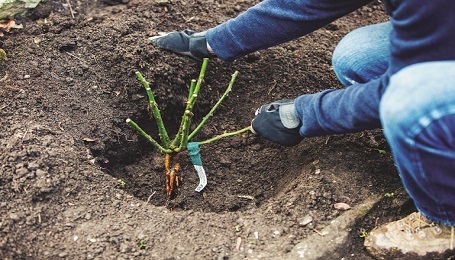 When transplanting or planting new ones it is always good to place the root ball in water, leaving it to soak for a couple of hours, then plant deep, back fill with compost, and water in. During the first season water at least once a week, particularly in hot, dry conditions. I must have planted over 10,000 bulbs in my garden over the last 13 years but every year I plant a few more and they never disappoint. I have bulbs for every season, starting with Snowdrops and Cyclamen followed by Crocus, Daffodils and Tulips then Lilies, Crocosmia and Acidanthera in summer, with the Nerines giving the final performance before the whole cycle starts again. We have a large garden so I buy bulbs in 100’s to give a real show of colour, mostly buying online and often teaming up with friends to reduce costs. November is a good time to tidy up roses by taking out weak or diseased shoots and reducing the height of larger bushes. This is only a first prune to avoid disease spreading and to stop too much wind damage. Save the hard pruning of established roses until spring. If you haven’t already marked branches that need taking out of trees and hedges, try to do your hard pruning before all the leaves fall so that you can identify dead branches easily, especially on mature trees. November to March is the ideal time to prune apple and pear trees. Aim for five or so main branches with an open centre to each tree, avoiding over-lapping branches. Cherry, apricot and other soft fruits can be pruned in late summer as they can be prone to fungal diseases if pruned in the colder months.